A good friend and I met one early evening shortly after Animale had its opening. Noting that you order at the counter and then have a seat, after which a server brings your food, we opted for a 6-course degustation for sharing. 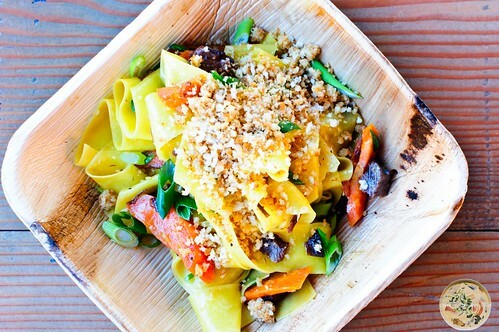 We started with a pappardelle — roasted carrots, green onions, beef cheeks, and buttery flat noodles that were topped with bread crumbs. The first bite was the indicator that led us to believe that the owners are modest. Such flavour and authenticity aren’t present in most casual dining, honestly. The pappardelle was, in a word, outstanding. 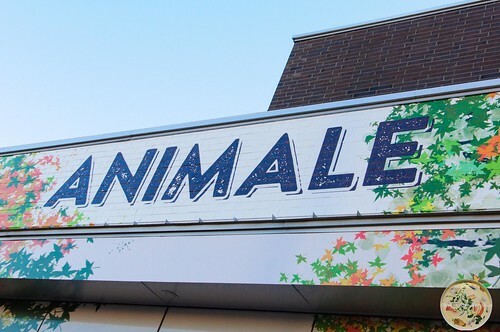 One of the exotic dishes we tried was animelle. This was bacon wrapped in sweet breads, topped with a spicy endive salad, and drizzled with mustard honey. 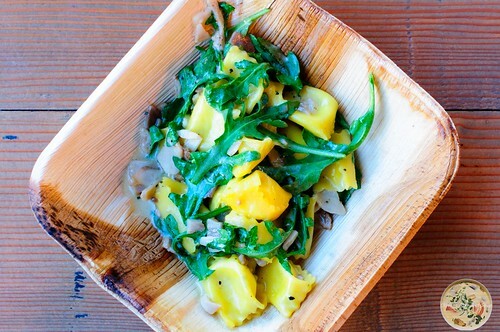 This dish fell outside of the usual fare found on Italian menus. Starting with sweet breads, American Italian restaurants don’t entertain such options. Dishes like animelle come with such pop that not only do you forget that it’s Italian but you make ticklers to yourself to plan return visits. Another exotic dish was sanguinaccio. This dish was remiscent of pollo e funghi that I had enjoyed at Osteria Langhe. 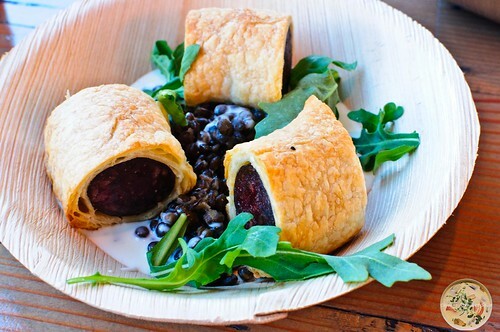 Instead of chicken and mushrooms wrapped in a tasty pastry, there was blood sausage encased in a puff pastry. Served on top of lentils in a La Tur citrus cream and a few leafs of endive, it becomes increasingly easy to dismiss spaghetti and meatballs as an Italian delicacy. When I was younger, there was a commercial that used to come on with a little boy wanting to spend the night at his friend’s house to avoid going home to a meal of liver. At the end of the commercial, the kid was nonplussed because, per him, “Larry’s mother is cooking liver, too.” He probably wouldn’t have been so displeased if his mother or Larry’s mother were cooking fegato. These rabbit livers were accented with thyme and served with mushrooms, shallots, and madeira atop toast. And they had been cooked so that the consistency was slightly spreadable on the toast. Delicious. Now, Osteria Langhe has a signature ravioli called plin that is addictive. There it’s simply mini raviolis filled with La Tur and parmesan cheese. 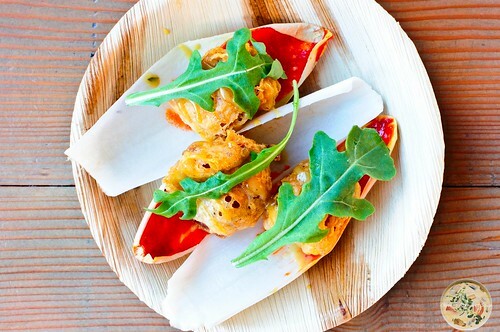 At Animale, they’re hand-pinched pillows filled with La Tur cheese and served with house pancetta and arugula. It is difficult for me to say which recipe I like most and I know that I shall return to Osteria Langhe and Animale countless times to sample their plin so I can eventually be decisive about which I prefer more. For the finale, we had panna cotta. 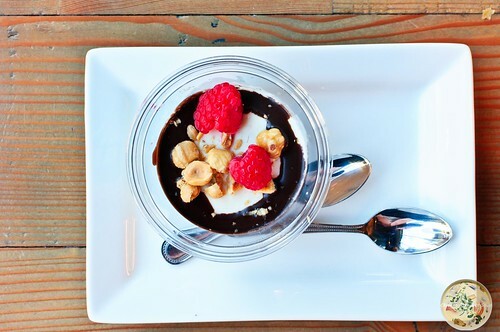 There was no way we were going to skip such a delight, and we had the dessert topped with a chocolate sauce and sprinkled with hazelnuts, and raspberries. The portion was perfect, given all the food we had eaten, and it was the same recipe from Osteria Langhe that makes it a difficult dessert to turn away from. The last time a restaurant owner mentioned opening a casual dining restaurant as a replacement for a fine dining French restaurant, it was a disappointment. Seeing how Osteria Langhe has raised the bar for Italian dining, from my personal experience, it was clear that quality would be top priority at Animale. Service falls in the Absolutely Best category, if I may add. The atmosphere may be laid back and completely devoid of pretense, but be prepared for the next best Italian restaurant in Chicago. With such bloom in flavour, I foresee long lines at Animale. I’ll be in those lines quite a few times. A friend told me that all I post on my Facebook page are photos of food. If he were following me on Instagram, he would keep a constant appetite after looking at all of the photos of food that I post there. And speaking of Instagram, someone who is on my friends list on that social media outlet had been posting photos of food at a new restaurant that opened in Logan Square. After seeing way too many photos of appetizing compositions, I made a prompt reservation for a visit. Osteria Langhe, at 2824 W. Armitage, was where all the magic happened. Yes, this is where I made four courses disappear. 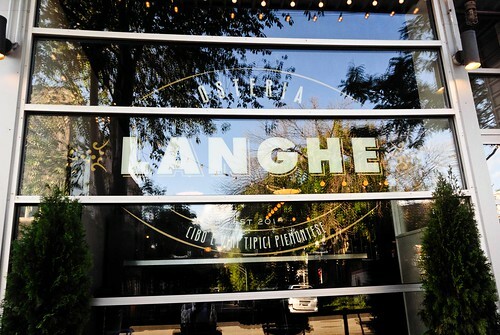 Osteria Langhe serves Italian cuisine that is more customary in the Piedmont region. With me being in one of my experimental moods, I didn’t bother looking at the menu. I gave the server my boilerplate disclaimer — I love seafood and while I have no food allergies, I hate nuts, and as to something to drink, simply tell the bartender whatever you plan to send to the table and have him or her mix something along the lines of a cocktail accordingly. For my first course, I had polipo. 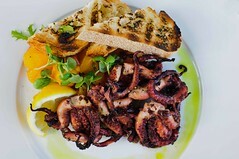 This dish of grilled octopus, heirloom tomatoes, basil, capers, saffron oil, and grilled bread was a fantastic starter. The octopus did not have a rubbery texture to it. The tenderness of it made cutting into it feel almost like slicing through very tender chicken. Although the salad of tomatoes and mini greens came without much of a vinaigrette, there was enough to accompany the salad while letting the octopus have the stage as the star. The bartender had mixed some libation that I never captured because I was engaged in lively conversation with the owner. However, it was quite refreshing and had a vodka base. Thanks to me not getting the name of the drink, I now have a reason to return, for sure, and to order the drink again. 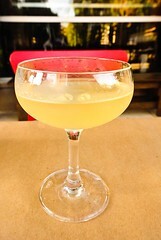 I will show a photo of the libation since that will be the only cue I will have as to what it was. 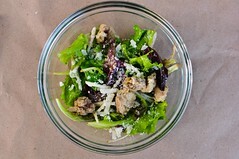 The second course was a salad of spicy mixed greens, kohlrabi, green peas, parmesan, and croutons of fried veal brains. Not having pork in my diet, I had forgotten to say that I am a pescatarian so that the fried veal brains would have been omitted, but the “sweetbread” croutons were actually flavourful. They were like fried cotton candy — if you can imagine that. Nevertheless, after waving my magic wand, that being my fork, I made the salad vanish. The third course of risotto with shrimp and scallop was where I thought that I had reached the apex of my dining experience. 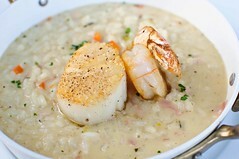 The risotto comes as a different variety per day and I was fortunate that I got the seafood version. A very, very creamy base to it, the risotto reminded me of French cooking. This dish, however, was Italian cooking at its finest. I savoured the risotto at great length because such a dish should not be devoured as if rushing thereafter is a necessity. With the third course, and as a continuation into the fourth course, I had a Paloma. 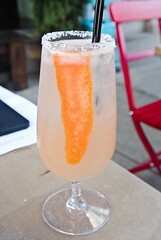 This was another summer drink made with grapefruit, lime sugar, tequila, and Filbert’s grapefruit soda. Those in Chicago may have, or may not have, ventured down into the 3400 block of South Ashland Avenue and quenched your thirst on a Filbert’s soda. Their grapefruit soda in the Paloma was definitely a divine ingredient. The fourth course was the dish that solidified my decision to become a regular at Osteria Langhe. 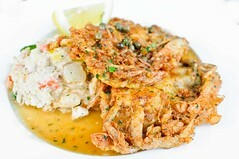 This plate of soft shell crab and insalata russa is one that everyone should try, especially those who think that they know where the best Italian food is served. The soft shell crab had an egg batter that made it very light and there was so much meat in the crab that each bite was an explosion. The insalata russa, which is a combination of potato salad and tuna salad, was a dream. Not a salad that one finds on Italian menus, it was an ideal choice for this dish and a great introduction to something authentically Italian that is not served in America-side Italian eateries. The fifth course was the finale. Nothing spectacular like a tiramisu, tartufo, biscotti, or cannoli, but creamy and outstanding for a wrap-up, I had a panna cotta served with mixed berries. 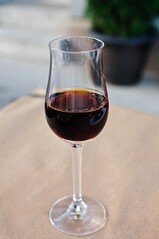 Along with that came a small glass of Amaro liqueur. 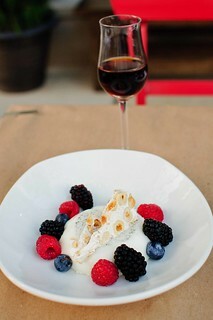 Having a dessert like this prepared at the restaurant means it comes without artificial ingredients. All you get is greatness in taste. One may say that there is a such thing as too many Italian restaurants. However, there is never a bad thing when it comes to discovering more to Italian dining than pasta and pizza. The introduction to Piedmont cuisine was absolutely luscious and a draw for what will be a constant return for me. The service is out of this world, from the owner who is fully engaging in conversation the way restaurant owners are in Italy to servers who can offer tempting recommendations to the bar service that mixes liquid satisfaction without any disappointment. Osteria Langhe has a “Make yourself at home” feel to it and regular customers — like I have decided to become — will attest that another Italian restaurant on the Logan Square landscape is a dream come true.